This paper deals with the impact of livelihood diversification through multi-activity and multi-locality on small-town development in Cameroon, Ghana, Rwanda and Tanzania. Based on a cross-country analysis of qualitative and quantitative data from ten different research sites, its central argument is that the tendencies of de-agrarianisation, agricultural commercialisation, livelihood diversification and the increased importance of rural–urban connections have accelerated an almost universal process of rural urbanisation. 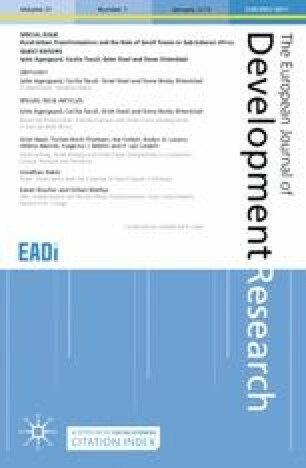 The paper casts innovative light on the discussions surrounding small-town development in Sub-Saharan Africa by showing that livelihood diversification and increased rural–urban linkages are not only crucial features in the urbanisation of the countryside but also of the transformation of small villages into emerging towns. This metamorphosis of livelihoods in rural regions, resulting from agricultural transformation, increased multi-locality and multi-activity, has contributed to the emergence and consolidation of small towns. Cet article traite de l’impact de la diversification des moyens de subsistance, par le biais d’activités et de localités multiples, sur le développement de petites villes au Cameroun, au Ghana, au Rwanda et en Tanzanie. Fondé sur une analyse transnationale de données qualitatives et quantitatives dans 10 sites de recherche différents, l’argument central est que les tendances à la désagrarisation, à la commercialisation agricole, à la diversification des moyens de subsistance et à l’importance accrue des connexions entre zones rurales et urbaines ont accéléré un processus presque universel d’urbanisation rurale. L’article jette une lumière innovante sur les discussions au sujet du développement de petites villes en Afrique subsaharienne en montrant que la diversification des moyens de subsistance et le renforcement des connexions entre zones rurales et urbaines sont des caractéristiques non seulement cruciales de l’urbanisation des campagnes, mais également de la transformation de petits villages en villes émergentes. Cette métamorphose des moyens de subsistance dans les régions rurales, résultant de la transformation de l’agriculture, de la multiplication des localités et des activités, a contribué à l’émergence et à la consolidation de petites villes. This research is part of the 4-year collaborative ‘African Rural–City Connections’ (RurbanAfrica) research project that finished in 2016. RurbanAfrica was funded by the European Union under the 7th Research Framework Programme (theme SSH), grant agreement no. 290732. Publications of the RurbanAfrica project are available at: https://rurbanafrica.ku.dk/publications/. The authors are especially grateful to their colleagues who actively took part in the respective field studies in Cameroon, Ghana, Rwanda and Tanzania and in the subsequent analysis and reporting phases: D. Azemao, F. Bart, A. Blache, R. Bénos, B. Charlery de la Masselière, B. Daniel, L. Douanla, N. Essah, N. Fold, R. Frempong, C. Kaffo, M. Kuete, S. Kelodjoue, N. Lemoigne, J. Lukumay, E. Mbeng, M. McLinden Nuijen, L. Msese, T. Mynborg, G. Nijenhuis, T. Niyonzima, C. Nzeket, S. Ørtenblad, R. Osei, G. Owusu, J. Pasini, S. Racaud, R. Santpoort, J. Schapendonk, B. Thibaud, N. Tofte Hansen, M. Tsalefac, L. Uwizeyimana, R. Vos and L. Yaka. Mainet, H. 2017. Town Dwellers in Their Networks: Urban–Rural Mobility and Household Strategies in Cameroon. Geografisk Tidsskrift-Danish Journal of Geography. https://doi.org/10.1080/00167223.2017.1354715. Steel, G., and P. van Lindert. 2017. Rural livelihood transformations and local development in Cameroon, Ghana and Tanzania. IIED Working paper, March 2017. London: IIED. http://pubs.iied.org/pdfs/10811IIED.pdf. Tacoli, C. 2017. Why Small Towns Matter: Urbanisation, Rural Transformations and Food Security. IIED Briefing, March. London: IIED/IFAD. http://pubs.iied.org/10815IIED. Accessed 25 Aug 2018. World Bank. 2018. World Development Indicators. http://databank.worldbank.org/data/home.aspx. Accessed 25 Aug 2018. Yemmafouo, A. 2016. Tous au Village le Week-end! À propos de l’intensification des Mobilités Hebdomadaires de Citadins vers les Campagnes au Cameroun. Les Cahiers d’Outre-Mer. 273, Janvier-Juin, http://com.revues.org/7715. Accessed 25 Aug 2018.